Review and approve invoices on the go to keep your AP process moving. 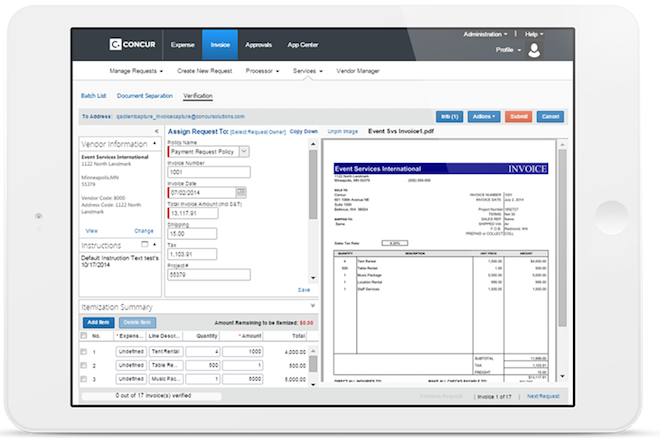 The Concur Invoice solution is accessible on a simple digital invoice app and desktop tool. Supplier invoices are checked automatically against purchase orders and receivables to ensure accuracy, eliminate duplications, and identify exceptions. Employees can use their mobile devices to view exceptions, approve invoices, and improve processing time. Ease the burden of invoice processing with invoice management on the go. 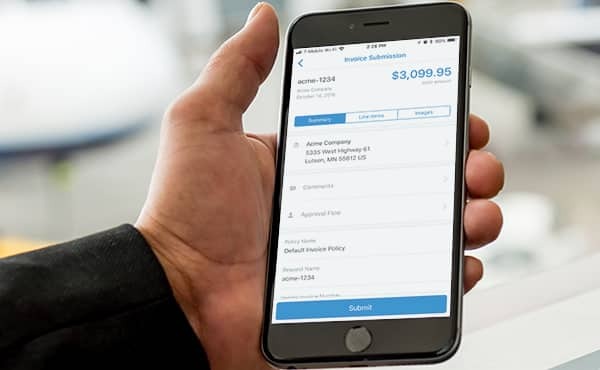 With an easy-to-use invoice app for iPhone, Android, and other devices, employees can view, approve, and track invoices from the field, while travelling, or in their home office. Invoices are handled quickly with the SAP Concur mobile app so your team has more time for other tasks. One of the greatest concerns for AP departments is security, which is why many professionals are wary of services that process business invoices online. You need an invoice solution that’s built with world-class security and encryption. 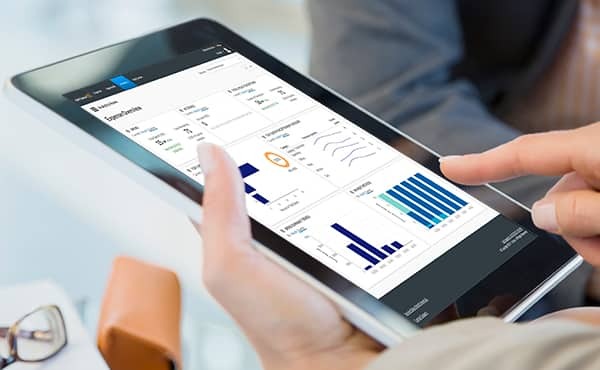 Personal data and credit card details are never stored on the SAP Concur mobile app, and missing or stolen devices can be remotely wiped. When invoices are processed faster and errors are reduced, your visibility into cash flow improves for more strategic spending decisions. Digital invoices, combined with your travel and expense data, provide a 360-degree view of all spend for more intelligent forecasting and analytics. Are you throwing away money on duplicate and fraudulent invoices? The average business receives duplicate invoices totaling $12,000 a month. For invoices less than $50,000, SAP Concur prevented payment of nearly $24 million in duplicate invoices. The average duplicate invoice in July, the peak month for invoice processing volume, was for more than $9,000. 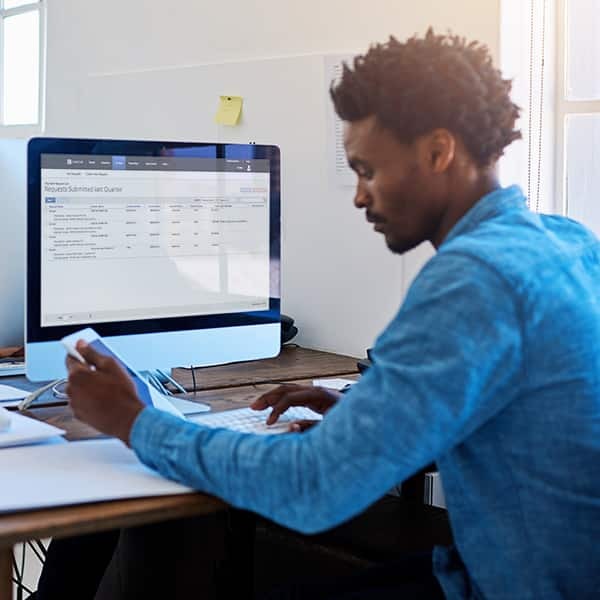 Duplicate invoicing is a big problem in the SMB market, likely costing businesses not just in terms of overpayment but in time spent to rectify the overpayment." Complete the form to have a sales representative contact you, or call (888) 883-8411 today. Fill in the fields below and a sales representative will contact you. When designing invoicing systems for small businesses, medium-sized organizations, or even enterprises, the usability of that system must be built for end users. Whether employees are creating and sending invoices for business, customizing an invoice template, or processing invoices from suppliers, it pays to keep procedures simple. People will be more likely to perform them correctly, saving AP staff hours of tracking down missing information and ensuring suppliers get paid faster. How can you make your invoice policy employee-friendly? Keep it simple: Cover the basics without getting lost in time-wasting details. Make the case: Emphasize the benefits of following the policy. Go mobile: Provide the tools your employees need to tackle AP tasks when it’s convenient. 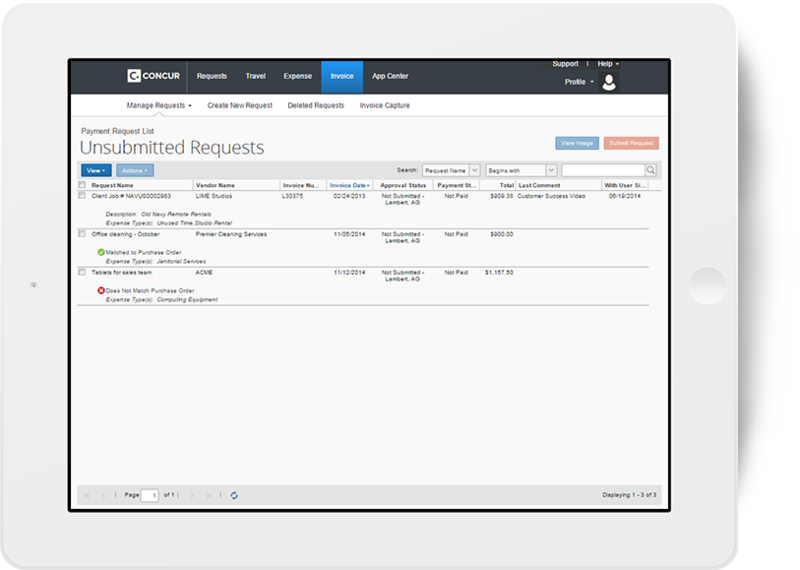 Managing vendor invoices and other payment request documentation is not just about the paper."